The nanosponge technology works by attracting a group of toxins called "pore-forming" because they bore holes in healthy red blood cells and cause cell death when uncontrolled ions flow in through the openings. Pore-forming toxins include bee and snake venoms, e coli, and toxins caused by antibiotic resistant bacteria, such as MRSA. The researchers used a particularly virulent form of MRSA (multi-drug resistant Staphylococcus aureus) in their lab experiments with mice. They found that introducing the nanosponges with the deadly MRSA strain resulted in the neutralization of the toxin in a high percentage of the mice. The first human therapy the research group will attempt will focus on treating MRSA, which attacks those with weak immune systems and is very difficult to combat now that it has mutated to resist most antibiotics. What these UCSD researchers actually built was a nanoparticle made up of a biocompatible polymer core coated with red blood cell membranes. From a small number of healthy red blood cells, they were able to collect enough of the membrane (through a separation process) to coat a whole host of nanoparticles. One nanosponge is about 85 nanometers wide, or 3000 times smaller than a red blood cell. 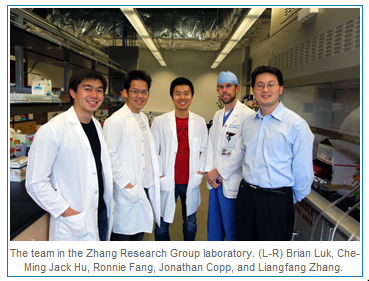 The Zhang Group research study was published in the April 14th issue of Nature Nanotechnology; “Jack” Che-Ming Hu, a recent UCSD PhD recipient and current postdoc, was the first author on the paper. Biomimetic materials and therapies have gained attention (and funding) in recent years for their ability to recognize the efficacy of how something works in nature, as the result of eons of evolutionary refinement. For another recent recent blog on biomimetic research in California, this time at the Institute for Collaborative Biologies, read UCSB Microfluidics Biotechnology Device Detects Chemicals With Canine Accuracy. To read about nanoparticles and bee toxins, see HIV Stung by Bee Toxin at WUSTL. Biotechnology Calendar, Inc. started more than years ago at UCSD and still holds its mammoth San Diego Biotechnology Vendor Showcase™ events twice-annually on the La Jolla campus. The date for our next show is August 22nd, 2013. We actively invite laboratory researchers from across the San Diego life science community to attend and see the latest in equipment technology, enjoy a great buffet meal, and chat with suppliers from the top companies locally and across the United States about their lab needs.